https://gitlab.com/gitlab-org/prometheus-storage-migrator as suggested by @colewhite. Build a Prometheus 2 Debian package with k8s support (we currently re-build the stock Debian package with k8s support added back). CDanis added a parent task: T213288: TEC6: Upgrade metrics monitoring infrastructure core components (Q3 2018/19 goal). CDanis added subtasks: T212312: prometheus-based graph significantly slower than statsd equivalent, T190992: prometheus: slow dashboards due to suboptimal query_range performance. fgiunchedi renamed this task from Upgrade to Prometheus 2.x to Serve >= 50% of production Prometheus systems with Prometheus v2. There was an open question re: having Prometheus 2 package co-installable with Prometheus 1, I think it is simpler to keep the package name the same and thus it'll be treated as a package upgrade by dpkg. This way we have to convert all Prometheus instances on a given host at the same time, though I believe that's acceptable. I've started migrating prometheus2003 data on graphite2001 although the rsync I ran yesterday wasn't complete so I've been rsync'ing the missing data from prometheus2004 and began the migration for analytics and services instances. Update: while converting global instance with full retention 10500h the migrator ran into a problem that would abort the migration. I've shortened the retention to 8500h hours (i.e. 354 days) and that has finished the migration successfully. I've reported the issue upstream as https://gitlab.com/gitlab-org/prometheus-storage-migrator/issues/4 in case that rings a bell to them. Backfilling the global storage is what's blocking having prometheus2003 back in production at this point so I'm leaning towards merging the migrated data even with a 83 days shorter retention than original. From the error reported in the upstream issue it seems that is data-dependent. Have you tried by any chance any other retention between 8500h and 10500h? Can we enable any more debugging to get a better idea of which metric is throwing the error so that maybe we can just skip it instead? There's no more debugging from the code as it is now AFAICS. Since the 8500h migration worked I'm thinking of going with that for prometheus2003 so that host is done and can be put in production, then start converting prometheus2004 (or prometheus1003) and see how far we get. Yes that's what that means, they'd be lost from prometheus2003 and possibly others too if we can't migrate more retention. re: affected users, I'm looping in Performance-Team since IIRC they were involved in https://gerrit.wikimedia.org/r/c/operations/puppet/+/404434 originally to ask if they'd be ok with losing ~84d days at the end of the current retention period for global instance. What does that mean, exactly? Losing 84 days worth of data that's already 15 months old? I have tried again a 9000h migration and that worked, I've now merged the migrated storage with existing storage and will be putting prometheus2003 back in production today. And so I did, turns out however that vector queries (e.g. rate()) in Prometheus 2 don't like if the results have the same labelset but are different metrics, like in our case of migrated storage plus the already-running v2 storage upstream issue. What I thought it was possible is: spin up a prometheus 2 collecting data while the v1 storage was migrating and then merge the two (migrated v1 + brand-new v2) to minimize the gap during migration, however as experienced above while this is possible it is not safe/reliable in the face of vector queries. So, change of plans: migrate v1 storage to v2 but don't start a v2 instance while migration is in progress, start v2 only when migration is fully complete and new metrics can start flowing. The downside of this approach is that the gap will be as big as the migration time. So far this time has been in the order of 24h for our biggest instances (ops and global). The other approach mentioned in the task description is to setup remote read from v1. I think however we should stick with the migrator and take a one-time hit of metric gap, instead of having to keep v1 around until the full retention has passed. Thoughts / input welcome as always! To test the new plan above I've started an rsync + migration of all instances of prometheus2003, starting from a snapshot of data from prometheus2004. As soon as the migration is done successfully then prometheus is started, so the gap is rsync time + migration time. For big instances hosted on spinning disks (global and services) the rsync time might be significant, in that case we can consider transferring the snapshot block device itself instead of looking at the filesystem. The migrations have finished for all instances on prometheus2003, however the same symptom remains. 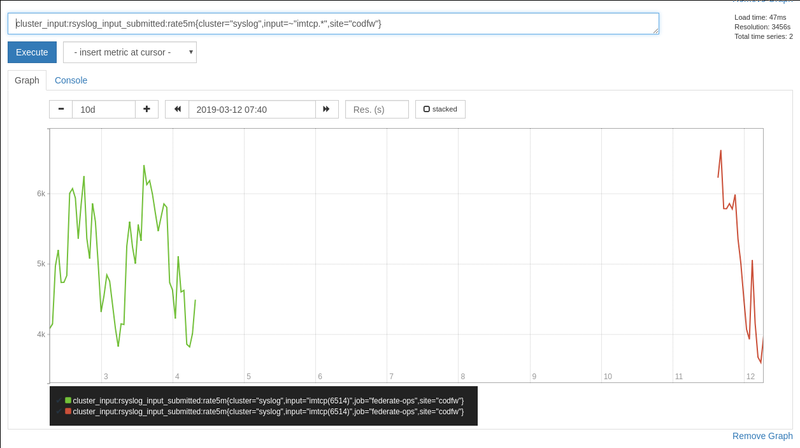 To explain in detail what's happening I'll give an example for the global instance and the cluster_input:rsyslog_input_submitted:rate5m metric before/after the migration in the screenshot below. The green line is pre-migration (i.e. data from Prometheus v1) and the red line is post-migration (i.e. when Prometheus v2 started again ingesting new data). The two metrics have the same labels yet are regarded by Prometheus as two separate metrics (see also the JSON below where the result list has two elements). In itself having such a result didn't use to be a problem before Prometheus 2.5 which shipped a fix for this issue making operations such as rate impossible on such results where two distinct metrics share the same labels. I have been debugging why post-migration the new metrics are regarded as "new", and at the same time why testing the migration on analytics instance worked as expected (i.e. no duplicated metrics e.g. for prometheus_engine_queries) although without much success so far. After focused code reading and head scratching it turns out the root cause is that persisted metrics weren't sorted during migration, this used to work fine but in Prometheus >= 2.5 it is a requirement. The upstream issue now has a MR to fix this problem: https://gitlab.com/gitlab-org/prometheus-storage-migrator/issues/5. For good measure I'll reimage prometheus2003 and start again a migration to validate things are working as expected. I've just repooled prometheus2003 and things seems to be working as expected! The gap in metrics starts at March 14th ~14 UTC. The widest gap is for ops instance, which ends at March 16th at ~23 UTC (i.e. ~2.5 days) other instances have shorter gaps due to taking less time to migrate. Status update: all instances but ops on prometheus1003 have finished migrating. This time I changed the strategy to actually backfill new + migrated storage (which was the plan all along!) and the maximum gap observed is ~1.5h which is acceptable IMHO. Status update: codfw and eqiad are served by Prometheus v2 now (single host in each, prometheus2003 and prometheus1003 respectively). The Prometheus v1 hosts are depooled now and I'll reimage them early next week after no problems are reported. Backfill for those will be simpler because there's no migration involved: we'll be copying the already migrated storage from the existing v2 hosts. As far as eqsin/esams/ulsfo are concerned I've thought about rsync'ing the data off hosts for migration, however there are a lot of metric files involved and rsync is going to take multiple hours before it finishes. During the rsync + migration time there will be no metric history, however new metrics will be collected as soon as Prometheus v2 is started. A faster strategy is to bypass the filesystem and copy an LV snapshot off the host instead, which usually happens at 50+ MB/s. Unfortunately the VGs on the bastions don't have free extents, so to take snapshots we'll have to resize the LV and the filesystem, which entails Prometheus downtime. ema closed subtask T212312: prometheus-based graph significantly slower than statsd equivalent as Resolved. fgiunchedi edited parent tasks, added: T220104: TEC6: Metrics monitoring infrastructure (Q4 2018/19 goal); removed: T213288: TEC6: Upgrade metrics monitoring infrastructure core components (Q3 2018/19 goal). Both prometheus1004 and prometheus2004 are now in service with Prometheus v2! So far no issues, syncing the whole storage from their counterparts took ~2h each.